UNIVERSITY PLACE, Wash. — The number is around 60, give or take, with a rumble that is part of the soundtrack to an already unique U.S. Open. About half the time, it comes from the north behind the 15th green and near the 16th tee where the one tree at Chambers Bay stands guard. The other half, from the south near the 18th tee. And in between, it’s unavoidable for those playing either the 16th or 17th holes. Of all the variables that go into conducting a U.S. Open, this is one the USGA could not control. Along the shores of Puget Sound between the edge of the Chambers Bay property and the blue water, stands a rail corridor vital to moving freight and passengers north and south through the Pacific Northwest. That rumble of clacking rails was just as much the sound during Thursday’s first round as the roars from the crowds for made putts or the moans of a shot lost in the wispy long fescue rough. 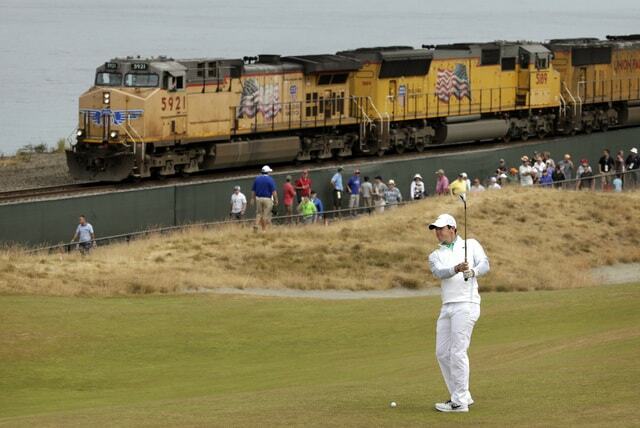 The operators of the train lines, BNSF, and the USGA had discussions on whether schedules should be altered for the four days of the tournament. The final decision: Nope, continue with the scheduled service. “The discussions were that your railroad is an important element of the Northwest and they didn’t have an issue,” BNSF spokesman Gus Melonas said. On a golf course already unique for its design, development and golf features, the trains are one more quirky element. The tracks are owned by BNSF and provide the movement of freight, along with passengers as part of Amtrak service in the Pacific Northwest. The line runs from Vancouver, British Columbia all the way to Eugene, Oregon. All told, roughly 60 trains pass the course on a daily bases with half going by between 8 a.m. and 8 p.m. and the other half working the overnight shift. The line between Seattle and Portland, Oregon, specifically is the busiest rail corridor in the Pacific Northwest. At times Thursday, those passengers got an up-close look at the U.S. Open without paying for a ticket. Playing No. 17, a par 3, Jamie Donaldson hit his first putt too hard and watched it roll into a bunker. After blasting out to 6 feet, he faced an important putt to save bogey. As he looked over a tricky putt, a southbound Amtrak train slowed to a crawl, brakes squealing. Inside, passengers pushed their faces against the glass to get a look at the course. Donaldson could have waited another 30 seconds for the train to pass entirely, but went ahead and dropped the putt. Of course, Donaldson couldn’t escape the trains completely. Moments later, he had to step away from his tee shot on No. 18 as a northbound Amtrak zoomed by. “We play with a lot of distractions week in and week out with a lot of people. … That’s just stuff you do, and you deal with it,” Ryan Moore said. The only element missing is the signature whistles. When the public is playing Chambers Bay, engineers regularly lay on the horn. BNSF instructed their engineers for this week to keep the whistles silent unless it’s an emergency. At one time, the USGA had hoped to take advantage of the train line being right there and use the passenger service as a way to get fans to and from the golf course. But the process proved too much of a challenge. Between getting fans ticketed and through security, to getting them off the train, onto a platform and on the golf course, there were too many moving parts to make the logistics work. There was a bit of a compromise. The USGA was able to put an electronic scoreboard outside the property of the golf course and near the tracks to serve the 16th hole. “It was slow, it was quiet, it was not a problem,” Phil Mickelson said.